Welcome to Season 8 of the ParentingAces Podcast! If you are new to the podcast, we are glad to have you - please take a look through our archives and listen to any of our past episodes that are of interest to you. If you are a returning listener, thanks for coming back! Withdrawal from the backdraw of our biggest national tournaments has reached a ridiculous level. 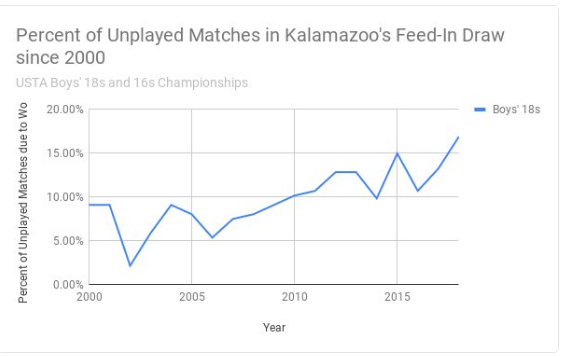 At last week's Kalamazoo Tournament (Boys 16s & 18s National Hardcourts), backdraw walkovers were at 16.89% up from 5.88% only fifteen years ago.